It would be the single biggest boost to downtown Toronto’s inventory of high-end office space in a quarter-century: a gleaming, $1-billion, two-tower complex that would straddle the railway tracks near Air Canada Centre, and throw in a new bus terminal for Metrolinx for good measure. But to build this massive proposed project, developer Ivanhoé Cambridge – the real estate arm of the massive Caisse de dépôt et placement du Québec pension fund – is getting a handout from Toronto’s cash-strapped municipal government in the form of property-tax breaks worth $142-million spread over 10 years after the project is finished. The subsidy, approved unanimously by Toronto City Council in July, comes from the city’s Imagination, Manufacturing, Innovation and Technology (IMIT) tax-incentive program, which dates back to 2008, when the recession hit and the city was looking for ways to attract new office space and jobs. Today, the city is in the middle of a massive office-tower building boom, adding more than four million square feet to the core in just the past three years. With a vacancy rate of just 4.9 per cent, Toronto’s downtown office market is the hottest in North America, ahead of San Francisco and even Midtown Manhattan. In the past eight years, Toronto’s economy has changed dramatically, but the IMIT tax-break program has barely changed at all. Before the Ivanhoé Cambridge deal, some of the biggest developers operating in the city had been approved for $290-million in potential tax breaks on 28 projects. And the multimillion-dollar handouts keep coming, even as city departments struggle to slash spending to balance next year’s budget and the city considers selling off some assets, including a slice of Toronto Hydro, as its infrastructure woes grow. City bureaucrats are due to report on a review of the program by the end of the year. Among those eagerly awaiting that is Mayor John Tory, who has said the city needs to take a good look at all of its programs, including subsidies for businesses, as it wrestles with its finances. 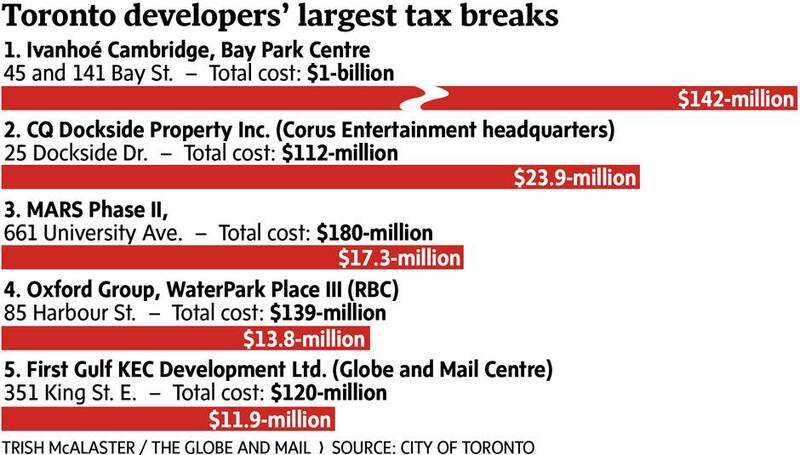 According to city documents, projects receiving or set to receive the tax breaks include Oxford Group’s WaterPark Place III at 85 Harbour St., a $139-million, 30-storey new waterfront home for Royal Bank of Canada, the country’s largest bank. That project is getting a $13.8-million discount. Oxford’s $270-million Ernst & Young Tower, at 100 Adelaide St. W., is receiving a $7.9-million break. The new eastern tower of the Bay Adelaide Centre, which cost $300-million to build and is now home to accounting and consultancy firm Deloitte, is getting $8.7-million. First Gulf’s $120-million project on King Street East, which will be home to The Globe and Mail and other tenants, is to receive $11.9-million. To get the tax breaks, projects with construction costs larger than $150-million must be approved by council. Smaller developments are approved by the city’s general manager of economic development. All must fulfill a wide range of criteria, including attracting tenants in a list of industries that ranges from biomedical to food-and-beverage but excludes retailing or warehousing. Residential buildings are ineligible. Proponents of the program insist the city comes out ahead financially. Here’s how it works: Say a developer who owns a parking lot is approved for an IMIT grant to build a massive office tower on that land. Once that tower is built, the value of the property skyrockets, as will the property-tax bills. A successful applicant will get a refund on a portion of the new tax bills, typically for 10 years after the project is completed. The refunds get smaller as the last year approaches, but can total 60 per cent or more of the increased amount of taxes that result from the construction of the project. After the discount ends, the landowner pays the higher annual tax rate. The idea is to help developers attract tenants – and the jobs they bring – by allowing landlords to offer cheaper rents. The reason the city benefits rests on the presumption the development would not have happened without the tax break. City staff say Coca-Cola Canada’s new headquarters on King Street East and the Ripley’s Aquarium next to the CN Tower would not have been built otherwise. The question now is whether Toronto needs such an expensive incentive for developers, who are already building office space at a breakneck pace. Paul Morassutti, the executive managing director of real estate services firm CBRE Ltd., said the downtown office boom is the result of market forces, not a subsidy program. Employers are moving back downtown because their increasingly millennial work force now lives in condos there, and they want to walk or bike to work. Even industries outside of the area’s traditional banking sector are flocking downtown, he added, citing Google Canada’s move into offices at Richmond Street West and York Street. “The tax incentives, in my world, just haven’t come up very much,” he said. These incentives can also create political controversy. A Globe investigation in 2014 revealed that former mayor Rob Ford and his brother Doug Ford, then a councillor, helped arrange meetings with city staff about an IMIT tax break for the North York headquarters of Apollo Health and Beauty Care, which was also a big customer of the Fords’ family business, Deco Labels and Tags. Apollo later got an IMIT tax break worth $2.7-million. The $142-million that Ivanhoé Cambridge’s massive project, called the Bay Park Centre, stands to receive is the biggest tax break ever approved under the IMIT program. The three-million-square-foot plans qualified under the IMIT’s special “transformative” category for megaprojects that are supposed to deliver benefits to an entire area. City bureaucrats and an external consultant hired to review the project say it will deliver $120-million in important public benefits that would never come to pass without the tax subsidies. 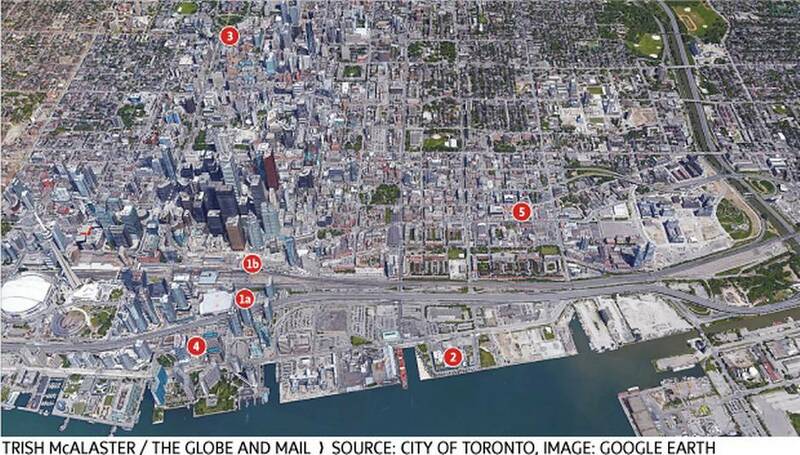 Among those benefits is a park – described as a “privately owned public space” – that would span the rail corridor, similar to Mr. Tory’s proposed rail-deck park further west, space that could become an East Bayfront light-rail station, and a new GO bus terminal to replace the one at Union Station. A 26-page external report drawn up for the city by Hemson Consulting Ltd. concluded after seeing confidential numbers from Ivanhoé Cambridge that the developer would likely not go ahead with its grand plans without the tax breaks. Arthur Lloyd, the company’s Calgary-based executive vice-president for its North American office building business, said in an interview that without the incentives, his company would abandon its plans for what he called a “world-class trophy asset” and seek to build a smaller, standard office tower on the site without the rail-straddling park or other amenities. He added that many other cities around the world where his company builds have similar incentive programs, including Chicago, where an office-tower project the company now has under way is benefiting from comparable tax breaks. Veteran developer Stephen Diamond, who is not involved with Bay Park Centre, warns the city would lose the kind of public benefits this project and other developments can deliver if the IMIT is scrapped, noting that Regent Park and the technology-incubator MaRS Discovery District have also had the tax breaks. “It’s being penny wise and pound foolish,” Mr. Diamond said. He is now involved in at least two projects that are eligible for IMIT grants, including large-scale plans to redevelop the area around the sprawling office campus of electronics company Celestica at Don Mills Road and Eglinton Avenue East. The plans include a mixed-used “regeneration” area along the route of the coming Eglinton Crosstown light-rail line with both office space and residential units. But Mr. Diamond warns that without IMIT, the office-space might not make sense financially. One critic of the program, Councillor Gord Perks, says the IMIT forces city hall to take the word of developers that without a rebate, a given development would not happen.